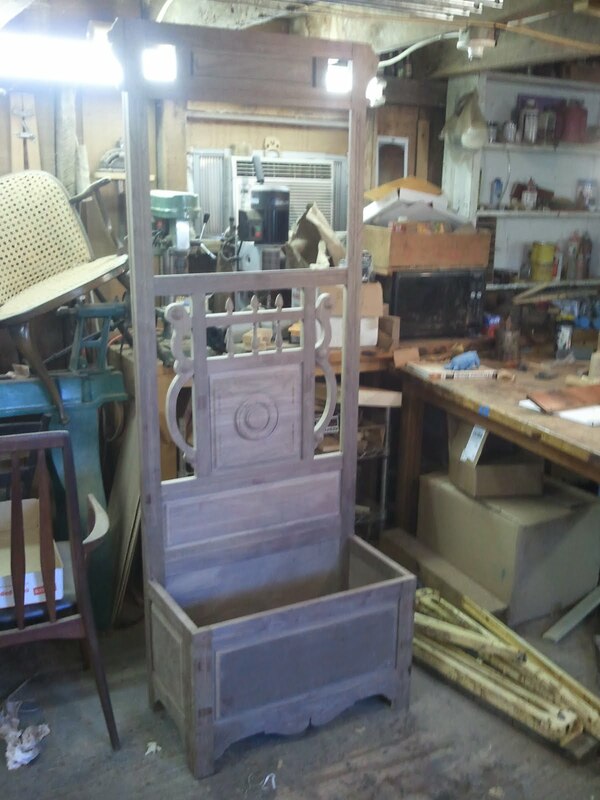 This is the third post concerning the reproduction of a 19th century hall tree. 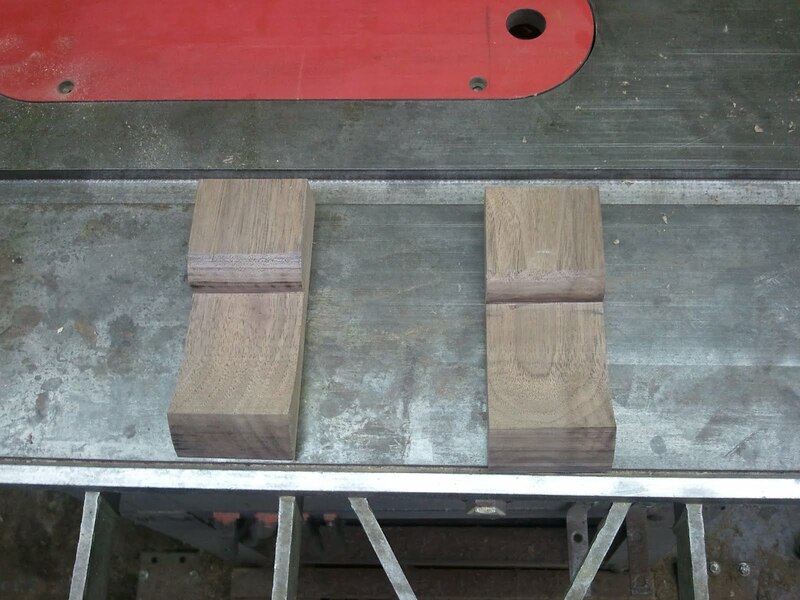 The previous two post have dealt with designing and making individual components. 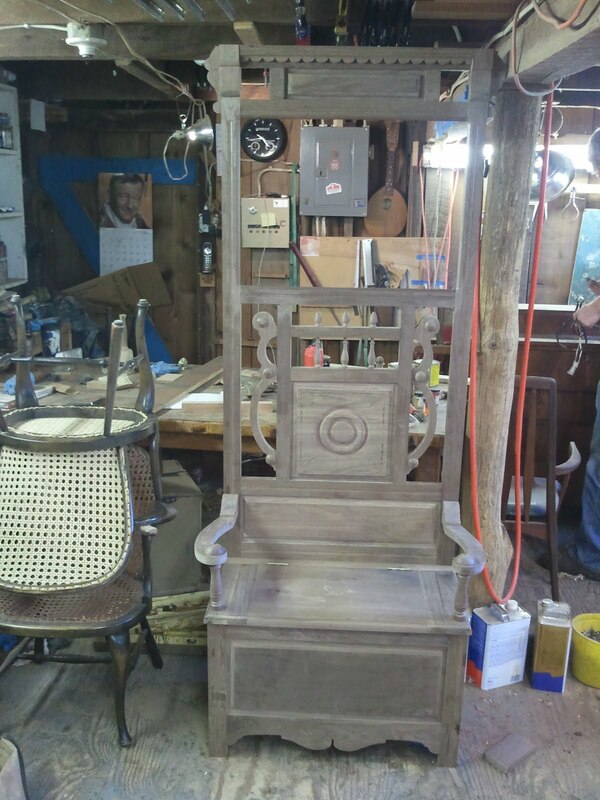 This third post will follow along with more of the same as well as show the assembling of all of the components to make the hall tree. 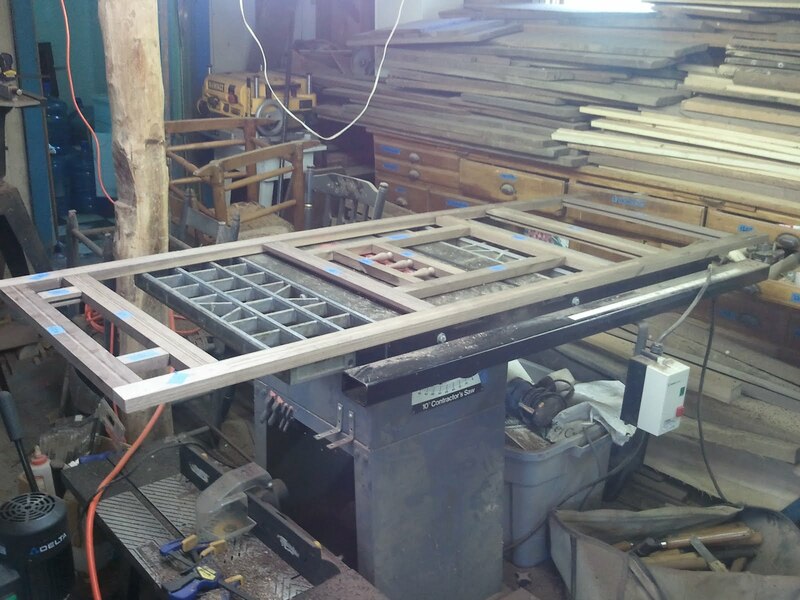 One thing that always surprises me when constructing a piece of furniture is the interrelation of all of the individual components. If a change is made or an error occurs, the result affects the entire piece. Sometimes this is a change for the better or an error that can be corrected, and other times it can have deeper consequences, like having to make a new part from scratch. I liken the process to walking on a tight rope. It requires concentration and a steady, focused hand to persevere. That being said, mistakes inevitably happen and it is good to know how to deal with them when they occur. Now enough with the philosophy, and on to the project! The first step was to make the portions of the molding made by the router. This consisted of the decorative lines running from side to side and the cove itself. 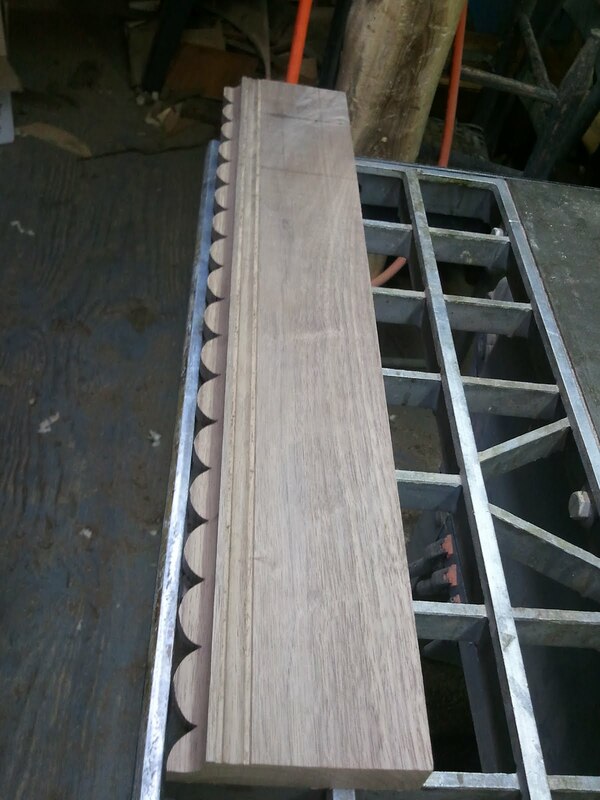 This was a very small piece of molding in terms of width, so I left a lot of extra waste material so I could have better control of the piece as I worked on it and also I could keep my hands away from the machinery. 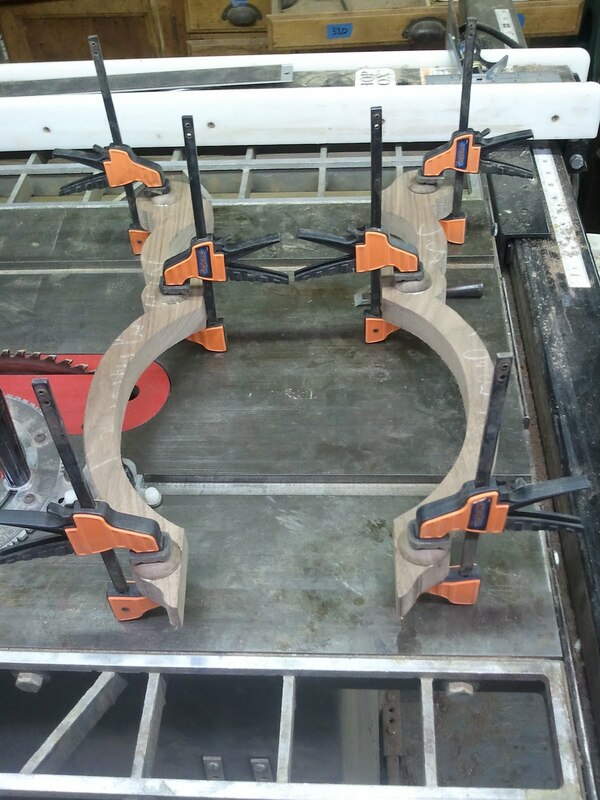 Once the routed parts were completed, I flipped the board over and drew the half circles on the back side of the cove using a compass. This next photo shows the half circle layout on the back of the board. I then took the piece to the band saw and cut the circles out. 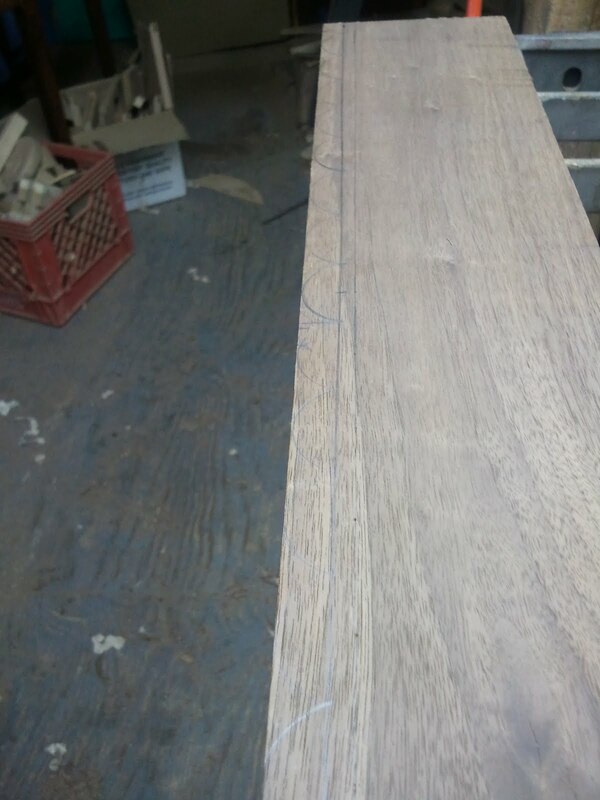 The photo below shows what that looks like. 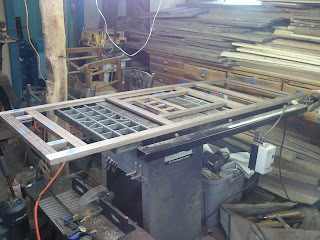 After that the last step was to remove the extra waste material by ripping it on the table saw. On either side of this molding is an applique that works as a transition piece from the molding to the frame of the hall tree. It's purpose is solely visual. 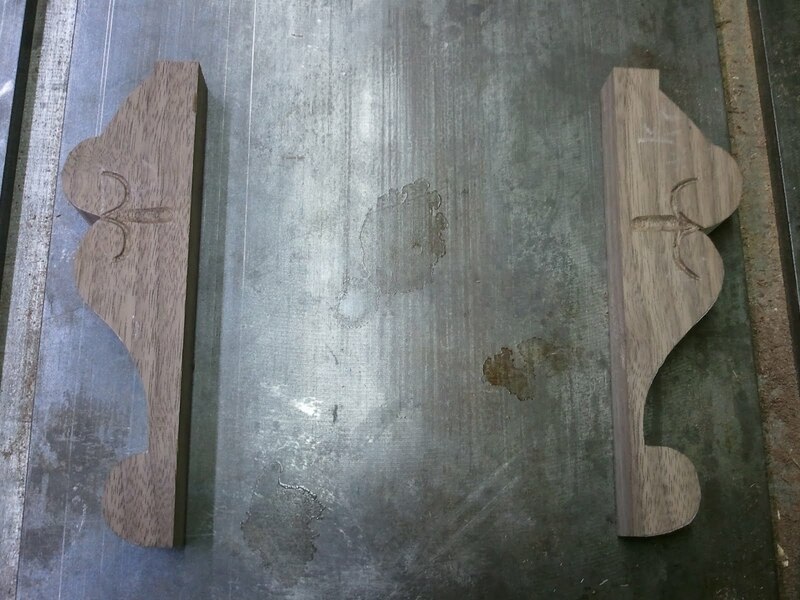 Below is a photo of one of these pieces followed by another photo showing the pieces made for the reproduction. The profile of these pieces were cut out on the band saw. 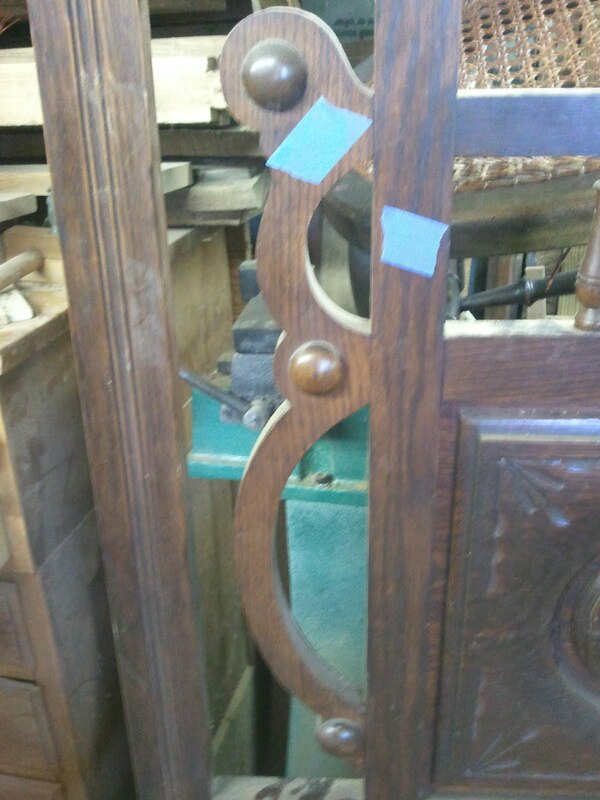 Next to those pieces, and applied to the sides of the hall tree, were some decorative pieces with carved hints of a volute. 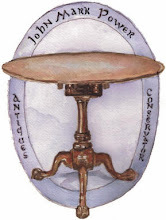 All of the carving on this piece was simple and were typical of factory carving of the time. 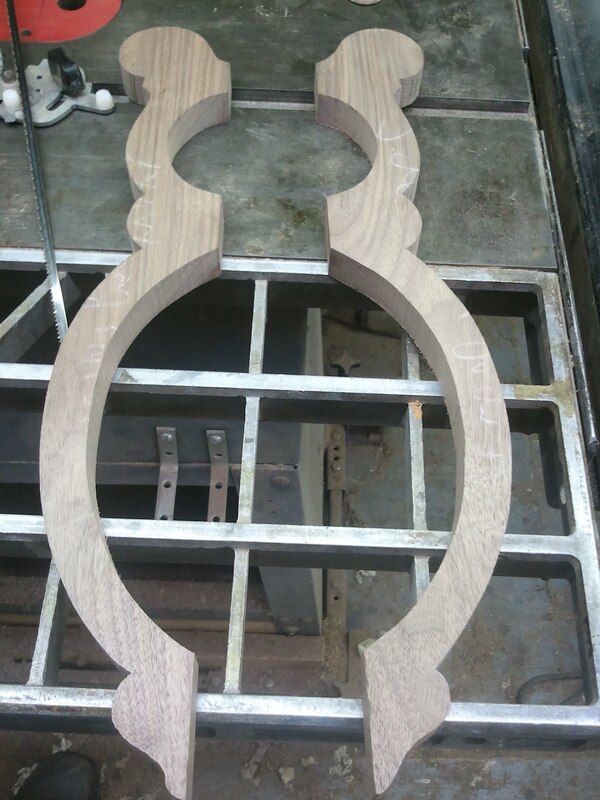 The intention was to add decoration and to hint at the idea of a highly carved piece. Most of the carving was shallow and was similar to drawing. The original applique is pictured below followed by the ones I made for the reproduction. 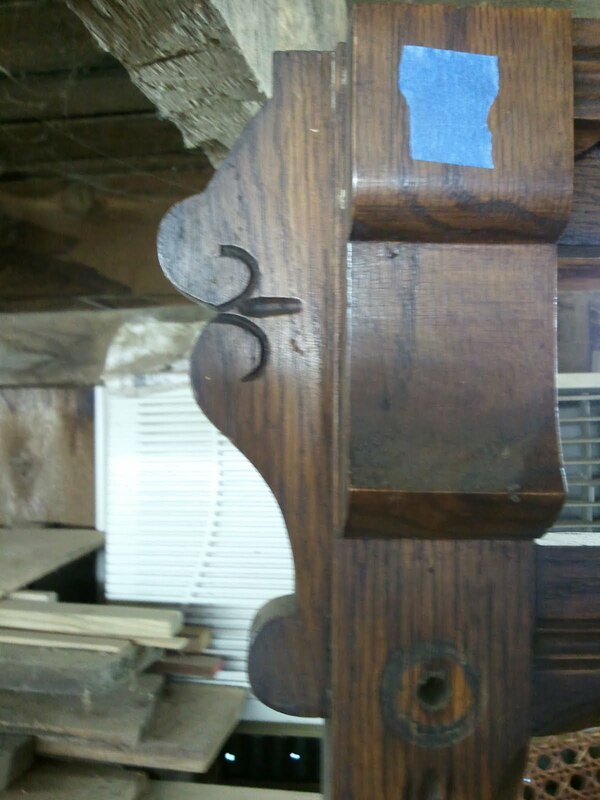 These last applied components are found in the middle of the hall tree and flank the central raised panel on either side. 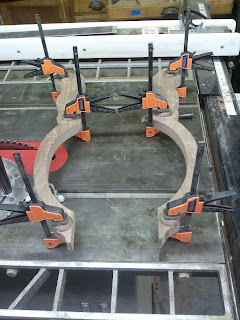 There were cut out on the band saw and then little turned domes were applied to the faces of the components. here is a photo of one of the originals. 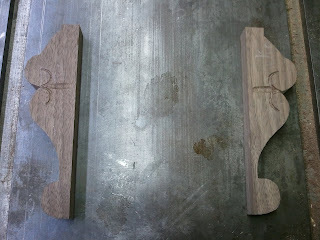 Here are the two pieces for the reproduction after being cut on the band saw. 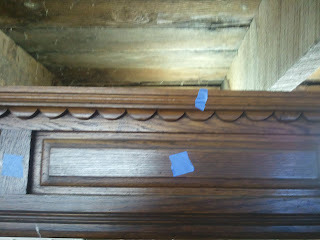 This photo shows the applied domes being glued in place. This photo shows the finished product. 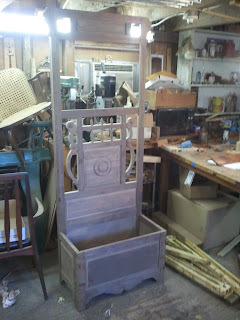 Now that all of the applied pieces were made it was time to assemble the hall tree. 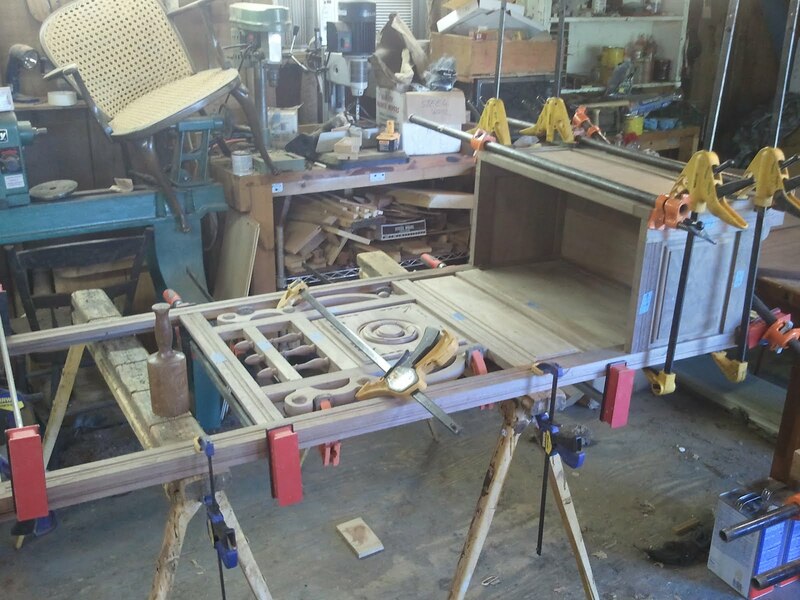 The first step in this was to take all of the rails and stiles and lay them out on top of each other with the tenons overlapping the piece it would mortise into. This allowed me to accurately layout where the mortises were going to be. Below is a detail photo showing this. 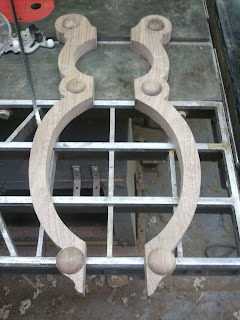 Rather than being flat, the pieces were stacked so I could trace around the tenons on to the face of the piece below it. The photo that follows shows the entire back assembled in this fashion. 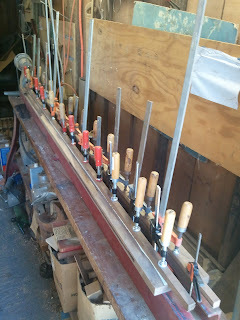 After the mortises were all cut, I dry-assembled the back to make sure everything fit together nicely. The next photo shows this. 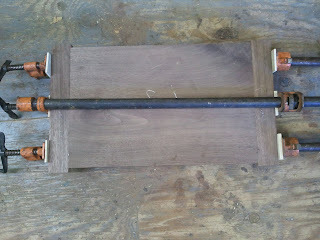 It is followed by a photo of the rails and stiles for the bench assembled. This was an exciting moment because for the first time I was looking at an assembled item versus a pile of parts! 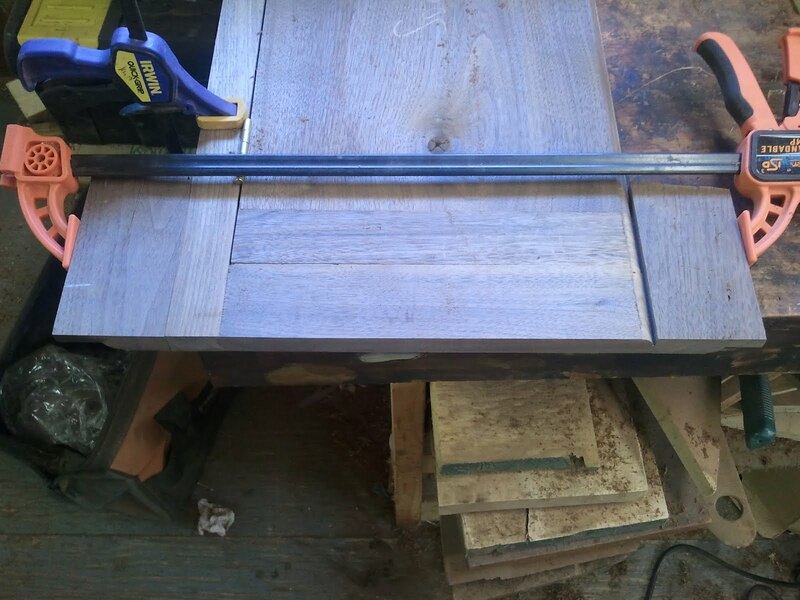 After all of the mortice and tenon joints were test fitted and fine tuned, I fit the raised panels in place and fine tuned their joinery as well. This photo shows the frame dry-assembled with the panels in place. 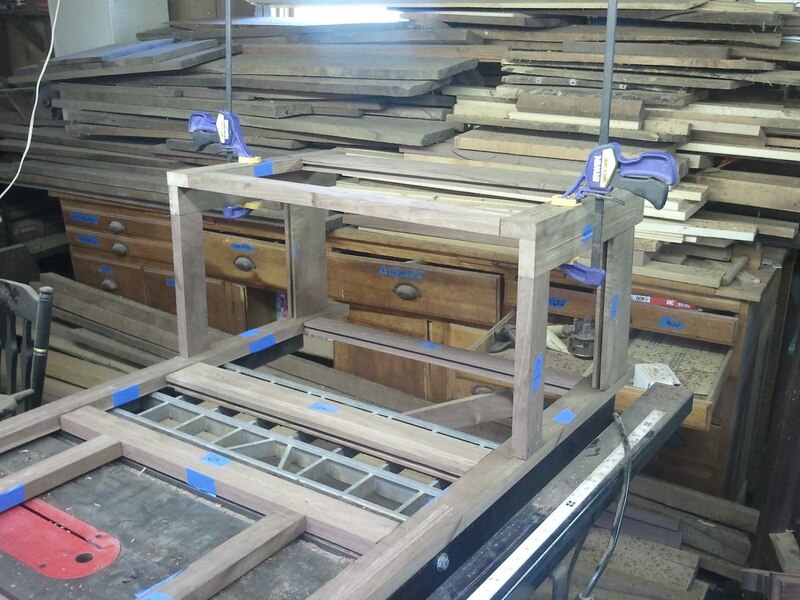 Before gluing the back together, I needed to apply some wood to the long back stiles that would stiffen these stiles up and help keep the back straight. 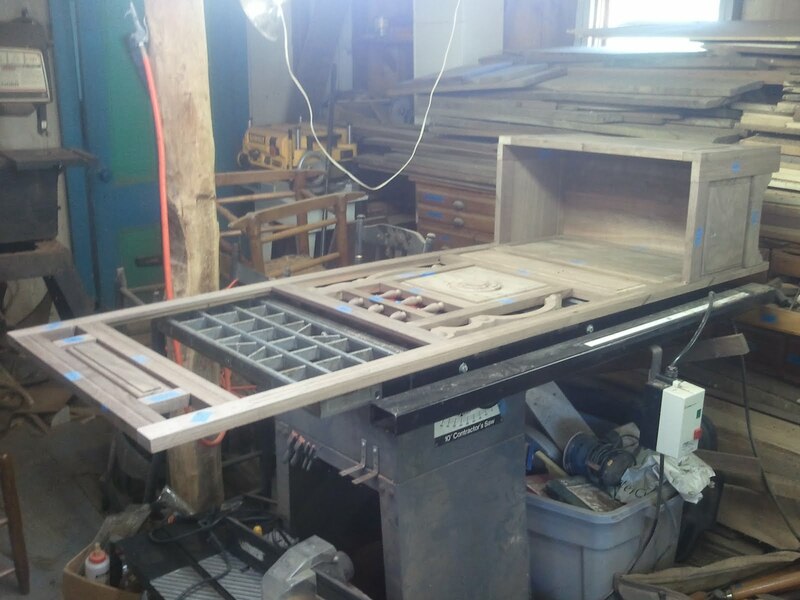 I wanted these piece to be straight and in a search for a flat surface to glue them on, I remembered a lathe in the shop with a seven foot bed. 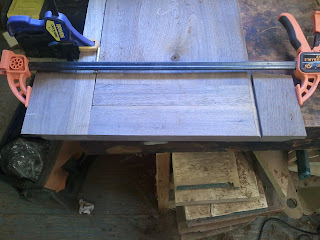 The bed provided the flat surface I needed so I glued these strips together clamped to the bed. 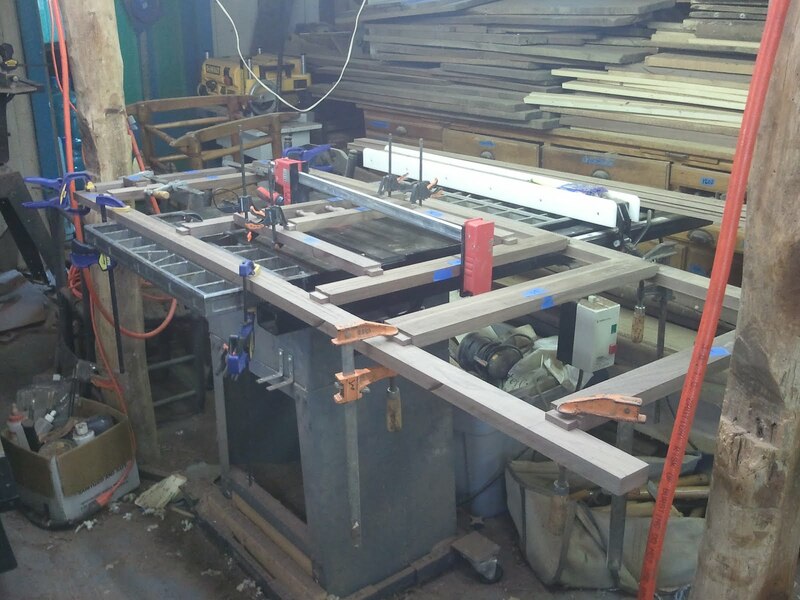 Below are two photos of this process. After that was completed, I removed the clamps and glued the hall tree together. 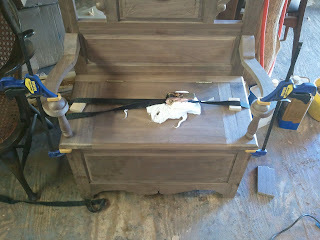 There were a few appliques as well as the seat I left out, but most of the gluing happened at this time. 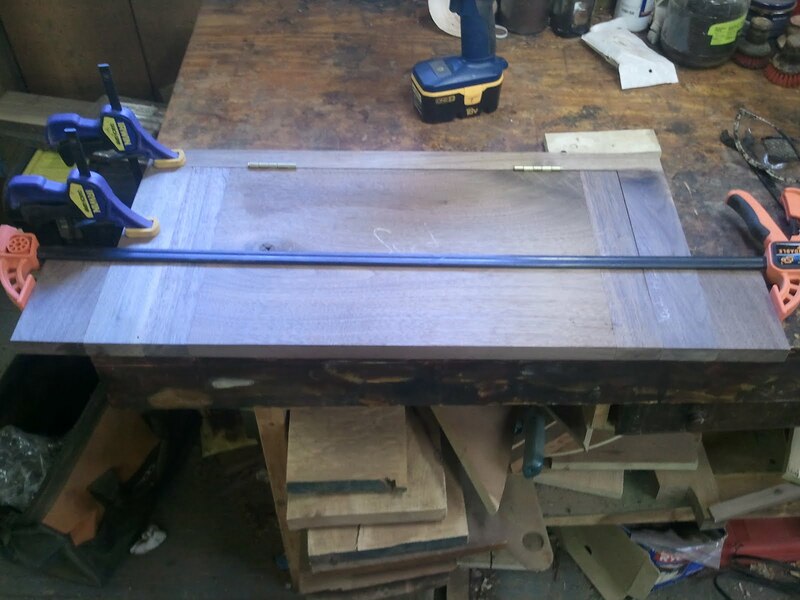 Below is a photo of the hall tree clamped while the glue was setting followed by a photo of the hall tree standing on it's own four feet! 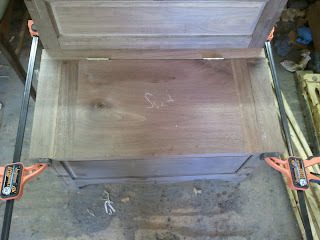 The next step was to make the lid for the box at the bottom of the case which would also act as the seat. 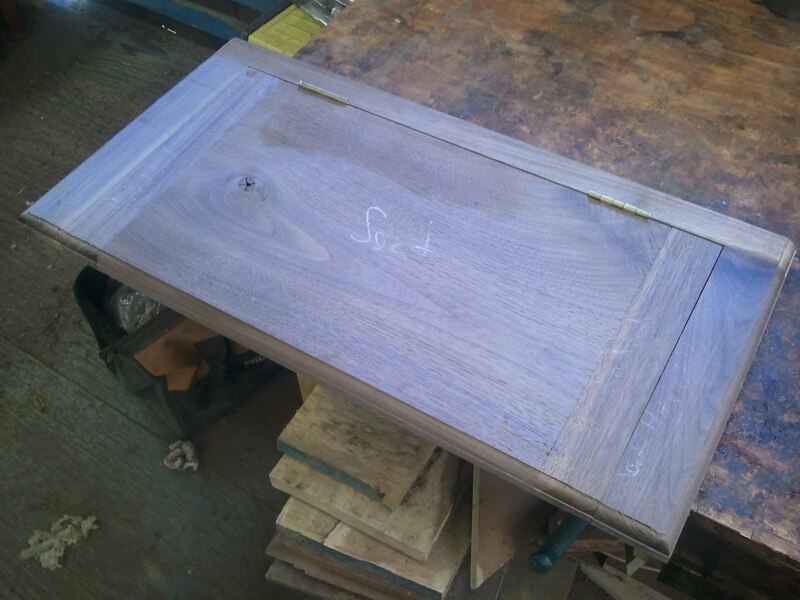 This lid comprised of a frame that went around the back and sides of the lid and the lid itself, which had breadboard ends to strengthen the lid. 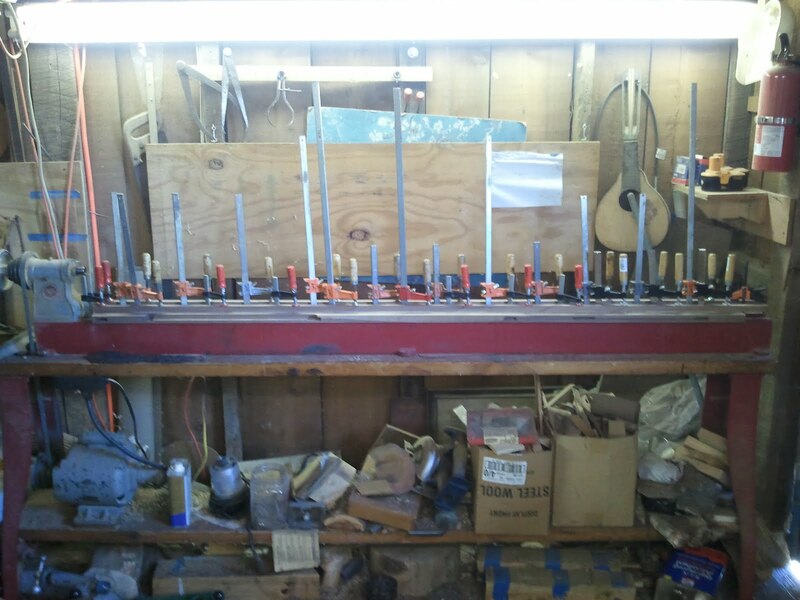 Below is a photo of the breadboard ends being glued to the lid. Once the glue dried on the lid the clamps were removed and the ends of the breadboard ends trimmed. The next step was to attach the hinges to the lid and the board that went across the back. After the hinges were in place, the boards which frame the lid on the sides were glued on to the back. 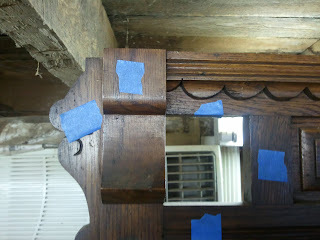 I glued them using the hall tree so that they would match the rest of the piece as well as possible. 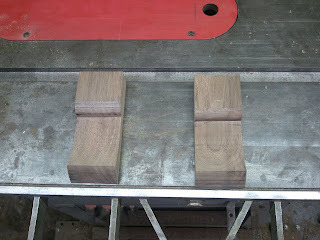 Now that the entire seat was assembled, I needed to produce the rounded molding along the edge of the seat. The next two photos show the seat set up for this procedure. I clamped boards on either end of the seat to run into with the router. 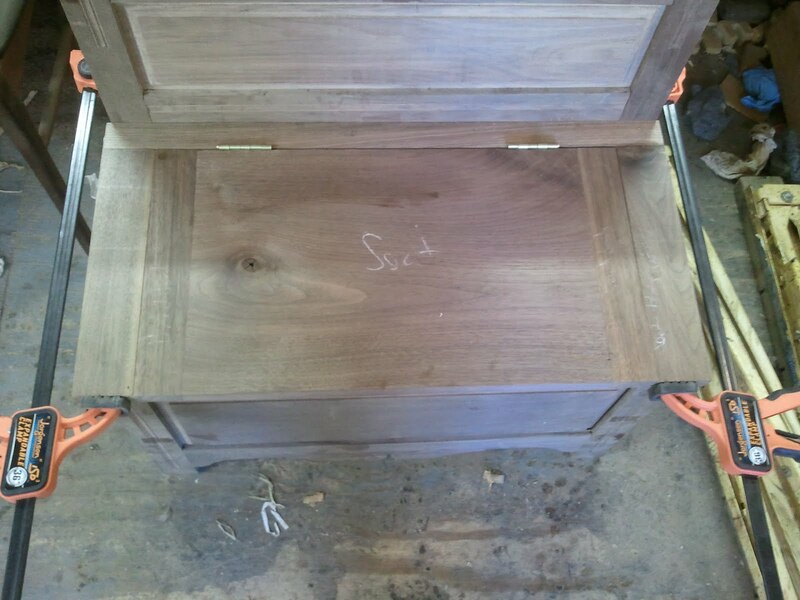 This prevented grain tear out and the boards were discarded after they had served there purpose.The last photo in the set shows the seat with the molded edge. The last step in the assembling process was to attach the seat and arms to the hall tree. 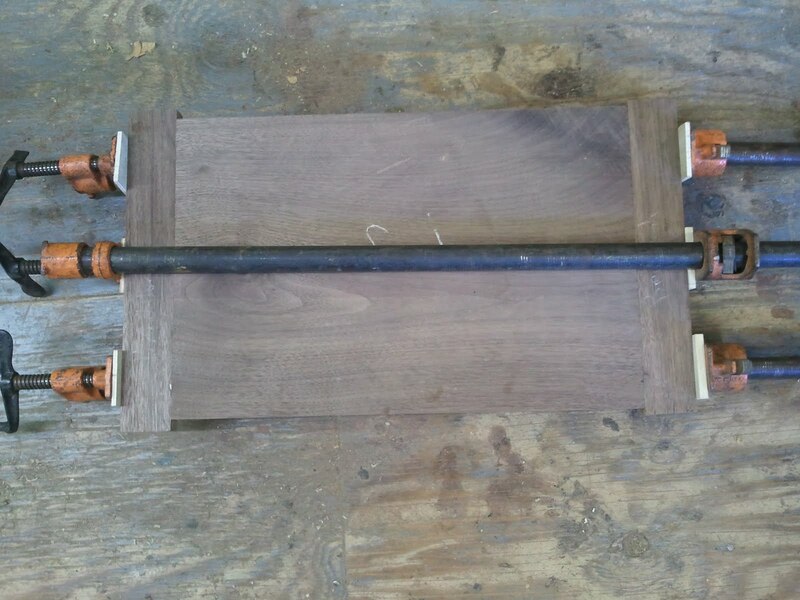 The arm posts had turned tenons which joined them to the seat and the arms. 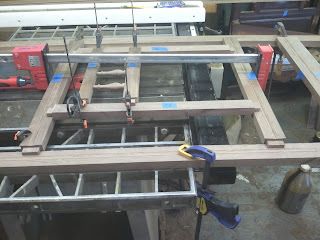 The seat and the arms were attached to the back with screws and I used dowels to attach the seat to the seat frame below. 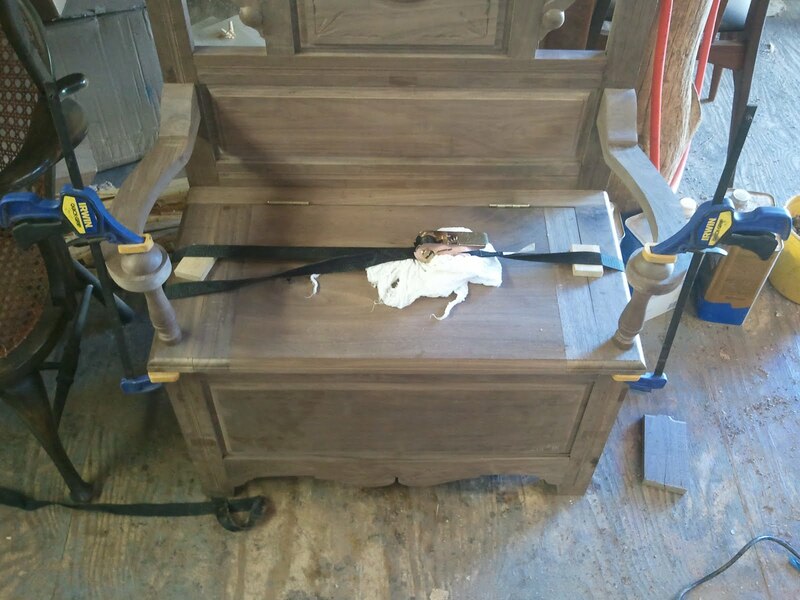 The photo below shows the seat and arms being glued in place. It is followed by two photos of the fully assembled hall tree. The next and final post will deal with the application of the finish and show the final product! 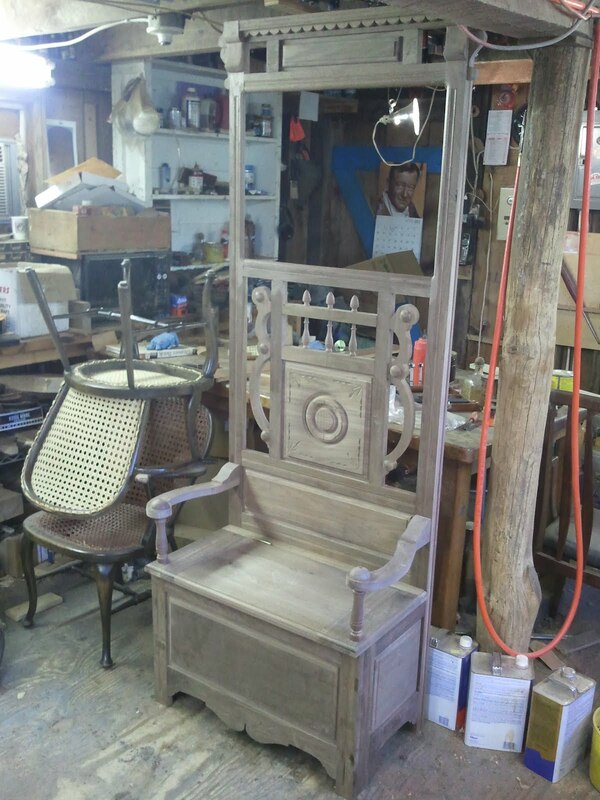 One note: I have left the lion carvings that are featured in the first post off of the hall tree in these photos because with the lions in place, the Hall tree is too tall to stand in my shop!